If you are an Adrenaline Junky or just enjoy the outdoors and the thrill of downhill Mountain Biking, this activity is for you. 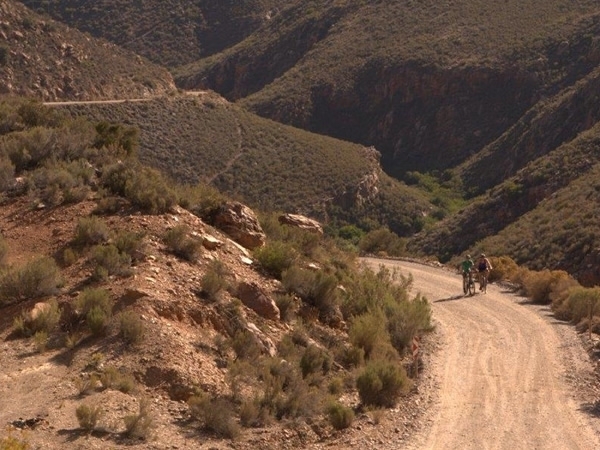 We take you to the Top of the the Swartberg Pass and you cycle back to Prince Albert. 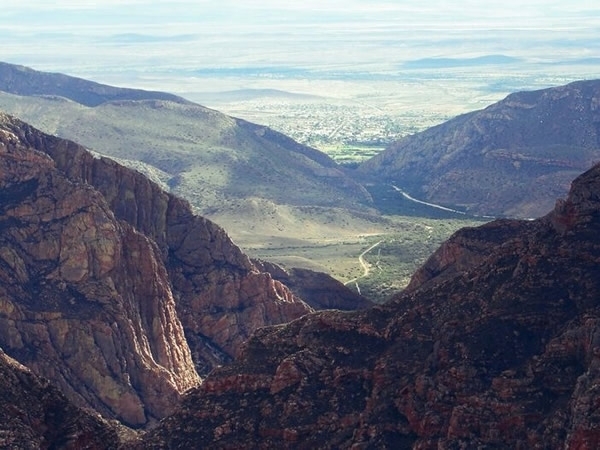 Apart from the thrill, the views are Spectacular and this is the best way to experience the Swartberg Mountain. 19km's of downhill with only 1 km of uphill cycling. transport back to Prince Albert. All tours start in Prince Albert at Dennehof Guesthouse or we can arrange pick up at your accommodation. We hop in the car with the bikes loaded onto the back and take a gentle drive up the mountain stopping on route to take photos and talk about the Pass and the work gone in the building this magnificent route. We drop you off at the turnoff to Die Hel, then it is 45 Km’s of up and downs into the lost valley we will have lunch with refreshments at Die Hel kiosk and you can chat to the local inhabitants of the Gamkaskloof Valley. We then load back up and transport you in comfort back to Prince Albert and Dennehof. We take you up Swart Berg Pass to Die Hel turn –off and then you cycle into the Hell 45 Km’s. This is one of the highlighted tours for social cyclists of any fitness level. We start in Prince Albert at Dennehof Guesthouse or alternatively we can pick you up at your accommodation. 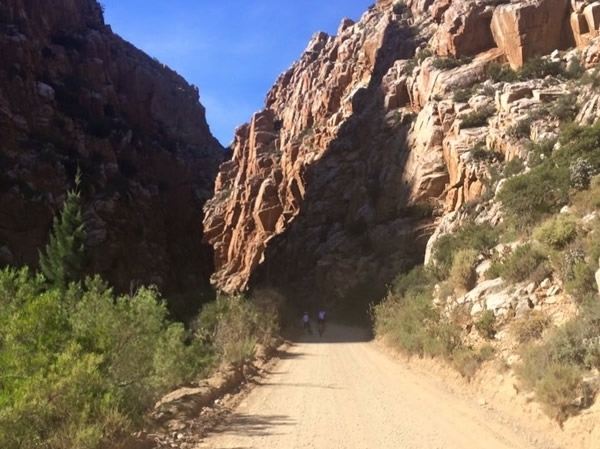 Our first Pass is the stunning Meirings-Poort which is a short 55 km away where we then swap 4 wheels for 2 and you cycle through the wonder land of squashed and folded rocks forming high wants on either side of the road. As we twist and turn, criss crossing the river 25 times until we pop out at the other end. While away time to walk up to the impressive waterfall and even jump into the crystal clear water to cool down. Then gentle drive to the second impressive pass, Montagu Pass. This pass opened in early 1847, allowing the passage over the Outeniqua Mountain and named after John Montagu, Colonial Secretary of the Cape. After this impressive cycle we pick up and drive over the Outeniqua Pass to Famous Road side Pizza café for lunch, after which we are on our way to the last Pass for the day. 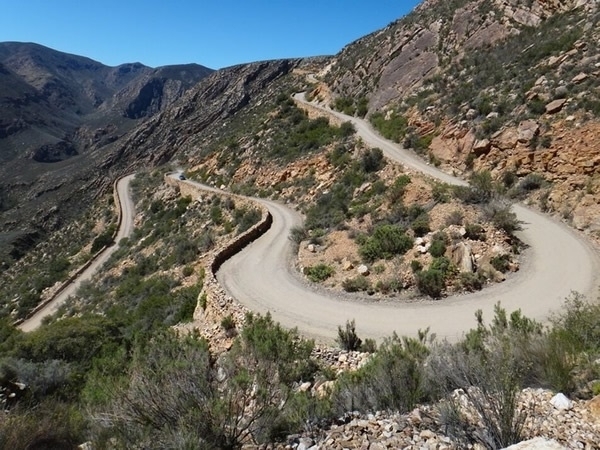 Swartberg Pass there is two options for this beautiful Pass. One being, dropped off at the foot of Pass, then a 10km of steep accent up to “Die Top” 1385m above sea level. Option two being, drive up to “Die Top” and cycle down the spectacular 19 km to Prince Albert. 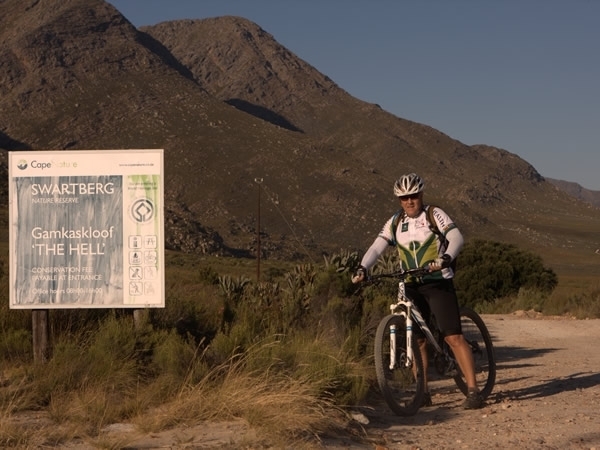 On your return to Prince Albert, you will have done three of the most amazing cycling routes in South Africa, cycling through magnificent scenery. Time: 8-8:30am just after breakfast. Easy ride, lovely for families. 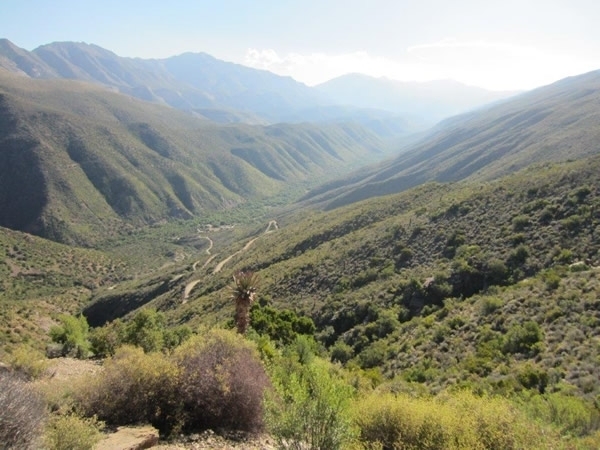 We drop you off at “Die Top”, then a 10km downhill cycle passing KOBUS SE GAT eatery, after which you turn right onto the Kruisrivier road for 15 km tar road then joining the gravel to Kruisrivier, another right turn onto the “Groenfontein” road with the mighty Swartberg Range on your right. Be on the look out for the array of wild animals that can be spotted. Our lunch stop for the day is at “Die ou Poskantoor”. We then load the bikes back up and travel back to Prince Albert with a full tour of the surrounding area. We take you on a highlighted tour of the Swart Berg Pass as we climb 1000 m to “Die Top”, stopping at the Dance Floor, Die Tronk, Teeberg and Die Top. At Die Top we stop for photo opportunities. This is also our coffee and homemade rusk stop for the trip. You can have a wonder around the area admiring the entire flora. Returning we show you the road to The Hell and the history of the lost valley. We take you on a highlighted tour of the Swart Berg Pass as we climb 1000 m to “Die Top”, stopping at the Dance Floor, Die Tronk, Teeberg and Die Top. At Die Top we stop for photo opportunities. Then it is a slow drive into the lost valley getting all the history of the inhabitants. We visiting old houses, the school, the info centre and then enjoy a traditional Karoo lunch and chat with local inhabitants at Die Hel kiosk, returning in the afternoon back to Prince Albert. Starting in Prince Albert and ending on the beach at Wilderness. 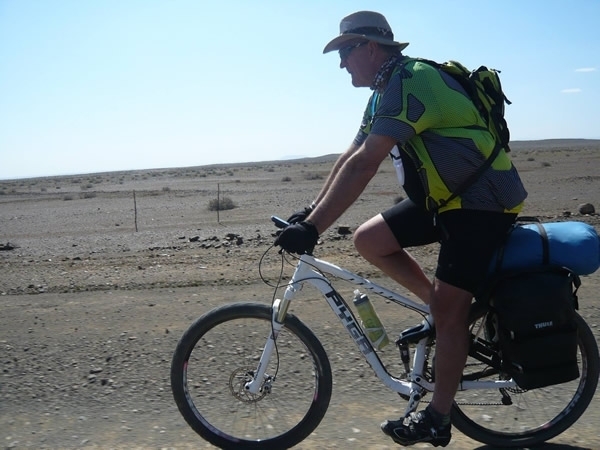 Great Cycle Tour for the semi-fit cyclist who what to experience cycling across the Great & Klein Karoo. 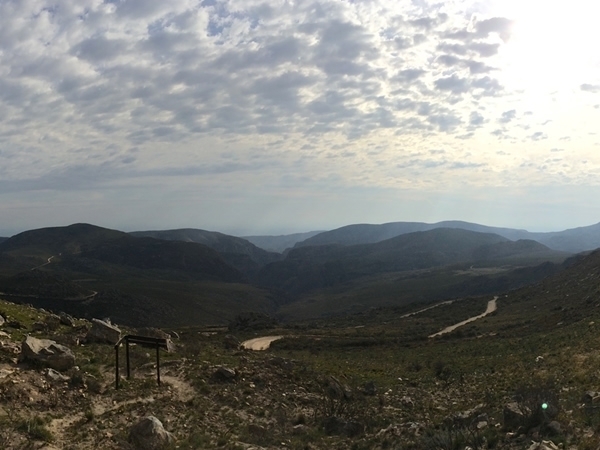 Day 1 ( 60km ): Up and over Swartberg Pass, climbing 1000m in the the first 19km, rest mostly down-hill to overnight stop on a 4Star Game Lodge. Dinner Bed & Breakfast, game drive included. Day 2 ( 80km ): Good gravel roads across the Klein Karoo, climbing 1200m during the days ride. Lunch on a farm mid way to overnight stop on a Farm Stay under the Outeniqua Mountains. Dinner Bed & Breakfast. Day 3 ( 40km ): In first 4km we climb 800m then it's all down-hill to the coast. For the Social Cyclist who would like to discover the Great outdoors, cycling across the Wide open spaces of the Tankwa Karoo, starting from a farm 20km's out of Calvinia and ending 3 days later @ the Tankwa Padstal. The quality of the tracks is mind blowing! Spending every night under the stars is just great! All that is needed is a comfortable Mountain bike, Padkos, 2-3 litres Camel pack, Large sunhat, because everything else is catered for 3 nights d/b/b. Everyone riding this had an interesting story or two to share. If you are looking for an adventure with a difference this ride is a must-do.